Hanging Christmas ornaments on your tree adds merriment and beauty to your home during the holiday season and has been a long standing tradition. Ornaments are handed down from generation to generation. 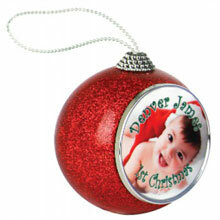 Personalizing those Christmas ornaments shows a family’s history and journey together. Add to the tradition for new generations to enjoy the memories of holidays past this Christmas. Rebus offers 5 ornament styles on our website and we have access to 15 additional shapes as well, please look at this brochure. 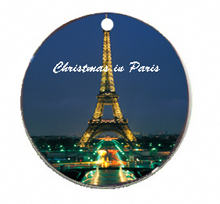 Our ornaments can be customized for any occasion from weddings to bar mitzvah ceremonies, to seasonal ornaments for Christmas, Halloween, Easter, and more. Heirloom Noel Ball Ornaments - Each Ceramic Ball Ornament (3"H x 2.5"W x 2"D) comes with a Gold Accented Hanger String and is pre-printed with "NOEL" and "Holly Leaves" graphics. You add your photo or artwork for a treasured memory! Heirloom Poinsettia Ball Ornaments - Each Ceramic Ball Ornament (3"H x 2.5"W x 2"D) comes with a Gold Accented Hanger String and is pre-printed with Poinsettia graphics. You add your photo or artwork for a treasured memory! This 3" red glitter ornament is the perfect holiday gift for family, friends and coworkers this season. Great for photographs of company logos as your full color image can shine with sparkle this year! 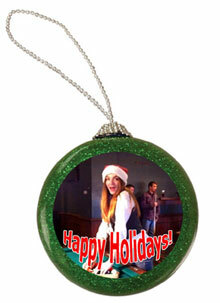 This 3" green glitter ornament is the perfect holiday gift for family, friends and coworkers this season. Great for photographs of company logos as your full color image can shine with sparkle this year! Porcelain Round, 2.8125" diameter, 2-Sided, Gloss, Pierced. 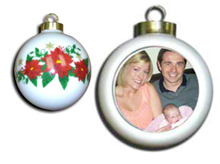 Large ornament for Christmas or Easter, imprinted with family picture makes an heirloom gift item.